Scrum-half Lloyd Williams opened the scoring for Cardiff Blues. 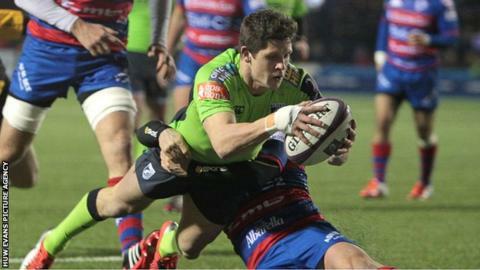 Cardiff Blues crushed Italian part-timers Rovigo in a one-sided Challenge Cup game at the Arms Park. The Welsh region ran-in 16 tries as they registered their record European score and winning margin. Lewis Jones' try in second-half stoppage time took the Blues past the 100 point mark. The win takes the Blues back to the top of Pool One in the Challenge Cup, with a trip to Grenoble to come on the final weekend of qualifying. The French side face the Blues' biggest rivals London Irish on Saturday, when a bonus point win for the Aviva Premiership side would put them back to the top of the table. Blues made 12 changes from their 22-13 defeat by Leinster in the Pro12, with prop Scott Andrews starting in the second row. The match also saw the return of Rhys Patchell to the Blues line-up for the first time since September, and he was prominent in a dominant display. The 104 point total beat the previous highest score by the Blues in European competition achieved in a 62-20 defeat of Calvisano, and the winning margin of 92 points is greater than the 58-point difference achieved against Connacht in 2008. The floodgates opened in the eighth minute when Lloyd Williams dummied over from close-range. Rovigo were hopelessly outclassed, with wing Richard Smith scoring a hat-trick with Williams and Ellis Jenkins claiming two each. The bonus point came within 20 minutes and early in the second half the Blues led 73-0 before the visitors hit-back with second-row Matteo Maran and centre Francesco Menon crossing for tries with full-back Stefan Basson - their best player - converting one. Rovigo looked likely to avoid the ignominy of conceding 100 points until replacement half-backs Gareth Davies and Lewis Jones crossed for tries in the final four minutes. Cardiff Blues: Rhys Patchell, Richard Smith, Cory Allen, Adam Thomas, Geraint Walsh; Gareth Anscombe, Lloyd Williams; Sam Hobbs, Matthew Rees (capt), Taufa'ao Filise, Scott Andrews, Chris Dicomidis, Josh Turnbull, Ellis Jenkins, Manoa Vosawai. Replacements: Rhys Williams, Thomas Davies, Craig Mitchell, Kristian Dacey, Macauley Cook, Lewis Jones, Gareth Davies, Gavin Evans. Rovigo: Stefan Basson; Peter Pavanello, Francesco Menon, Joe Van Niekerk, Lorenzo Lubian; Luciano Javier Rodriguez, Marco Frati; Nicola Quaglio, Enrico Ceccato, Massimiliano Ravalle, Matteo Maran, Jean-François Montauriol (capt), Emiliano Caffini, Edoardo Lubian, Edoardo Lubian, Guglielmo Zanini. Replacements: Luke Mahoney, Renzo Balboni, Andrea Pozzi, Giacomo Riedo, Edoardo Ruffolo, Giorgio Bronzini, Denis Majstorovic, Enrico Manghi. Touch judges: Greg Garner (England), Paul Dix (England). Fourth official: Barrie Gregory (Wales).